Andrew Sackett joined SWEC as Assistant Musical Director in 2012 and was appointed Musical Director in 2017. Andrew has had a wide and varied musical career which has included genres from classical to jazz and musical theatre to rock and pop. He was born in Sheffield and at an early age had piano lessons from Fanny Waterman. He studied the organ at Lichfield Cathedral and later at the Royal Northern College of Music and has held posts as organist at Manchester Cathedral, Carlisle Cathedral and Tewkesbury Abbey. During his time at Tewkesbury his choir made several CDs, broadcast on BBC Radio and TV and toured extensively throughout Europe and USA. 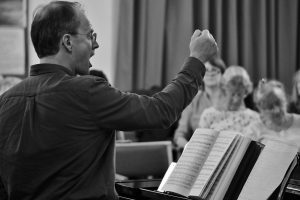 He has been chorus master for a number of larger scale choirs, working along side eminent conductors such as Sir Charles Groves, Sir Simon Rattle and David Hill. In September 2000 Andrew decided to move into a rather different field of music and was appointed Musical Director for ‘Holland America Cruise Line’. During his time at sea he was Musical Director for several Grand Voyages as well as the 2008 Golden Anniversary 114 day World Cruise where he worked with acts ranging from opera singers to the Osmonds! After a few thousand nautical miles and having visited every corner of the world, since 2009 Andrew has been based in London and is in great demand as a freelance musical director, pianist, organist and repetiteur. Through his work with City Music Services Andrew conducts city firm choirs and is Assistant Director of Music at St Peter’s, Eaton Square. He is also Music Director for the Frankie Valli show ‘Big Girls Don’t Cry’ which is currently touring the UK. Having completed five seasons working with SWEC as accompanist and Assistant Musical Director, we are delighted that Andrew is now our Musical Director.